In South India (Karnataka) this gravy is given during post pregnancy (postpartum) to increase body heat so as to keep them warm which reduces the chances of getting infected from cold and cough. It is also said that it increases milk production. This is not recommended during pregnancy, others can have it like regular dish. Add onion & garlic (20 cloves), saute till onion turns light brown. Add dill leaves saute for 2-3 minutes. Grind it to smooth paste with coconut & veg/non-veg masala powder. Add the garlic (10 cloves) till it turns light brown. Add paste & fry for 2mins. Add little water (small cup). It should be thick like chutney. Add salt & cook in low flame till it leaves oil. 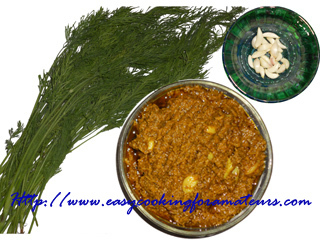 Dill Leaves gravy is ready to serve with rice or chapatti (Indian flat bread). That's so cool! Sounds delicious too! Great looking and flavourful gravy..
A very new recipe..sounds n looks delicious! New to me but it looks yummy! Wow nice recipe using Dill leaves.. never tried dill leaves this way and sounds interesting..sure I am book marking it and thanks very much for sharing this recipe. Dill is one of my favourite herbs. This looks and sounds very delicious and healthy! sounds interesting.. worth a try! Very interesting and very healthy! I have been following your blog for a long time and I never fail to learn something new! I learned something new again. I love dill.